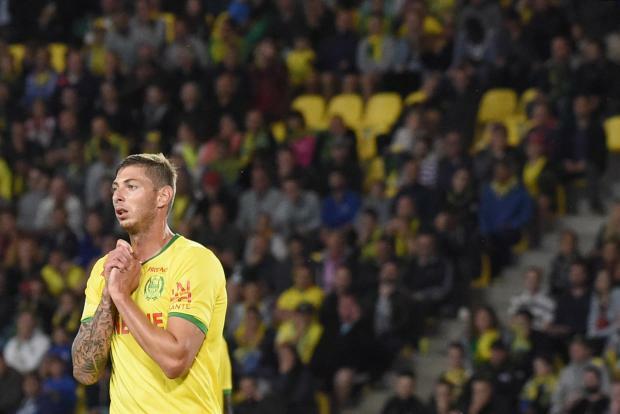 A file photo taken on September 18, 2017 in Nantes' Argentinian forward Emiliano Sala. Sala, signed on Saturday from French club Nantes for a reported fee of €17 million, was flying to Cardiff aboard a small plane that disappeared from radars around 20 kilometres north of Guernsey on Monday night. "One plane, one lifeboat are still searching. Another plane will rejoin after refuelling. 1,155 square miles have been searched. A decision whether to search overnight will be taken at sunset," Guernsey police said at 1610 GMT. Meanwhile, one of the rescuers searching for the missing plane admitted they were "fearing the worst". "If it came down as an uncontrolled landing, the plane would've broken up, in which case there is no hope," said Fitzgerald, whose volunteer-staffed company assists British and French coastguards. Sala's father, Horacio, earlier told Argentine television station C5N he was "distraught" at the news, which he discovered from press reports. Cardiff called off a training session planned for Tuesday morning, while Nantes have had their French Cup tie against third-tier side Entente Sannois Saint-Gratien postponed from Wednesday until Sunday. Meanwhile, Nantes fan group 'A La Nantaise' released a statement calling for supporters of Sala's former club to gather in the centre of the city for a vigil on Tuesday evening. He joined Nantes in 2015 for one million euros and scored 42 Ligue 1 goals in three and a half seasons at the Stade de la Beaujoire.